Happy Quilting: Christmas Keepsakes Blog Tour and Giveaway!!! Today is my stop on the Christmas Keepsakes Blog Tour hosted by Shabby Fabrics. This is their very first blog tour and I am so excited to be able to be a part of it!! 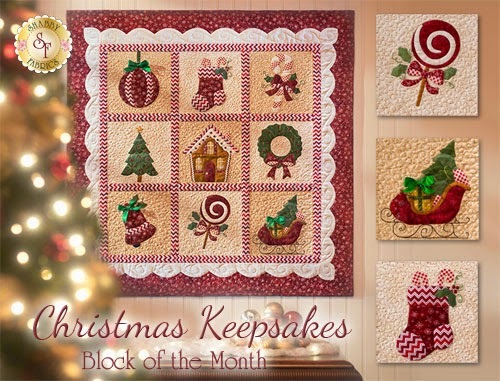 Christmas Keepsakes is the new Block of the Month exclusive to Shabby Fabrics. It is a 10 month program offered in both Laser Cut and Traditional Applique. This quilt measures 36" x 36" featuring 9 adorable eight inch appliqued blocks. As part of the hop, we were asked to play with a block or two and share our experiences of using Laser Cut Applique. And let's just say, I love it!!!! I got to work on the Bell and Gingerbread House blocks. And didn't they turn out so cute!!! So let me share with you a bit about my experience with Laser Cut Applique!!! To start, I received two lovely packages in the mail. Each package had a wonderful set of instructions, and when I turned them over, I shrieked!!! Oh yes, those are all of the applique pieces already cut!!! I opened the package to find that not only are the pieces already perfectly cut out for you, they also have fusible web on the back of them. So basically, I had to trim my block background to 8 1/2" square and head over to the ironing board. So easy!!! Using the position guide sent with the packet, I placed all of my applique onto the block. And then simply pressed and fused the applique in place. So my applique was ready to stitch about 5 minutes after opening the package. I am so loving Laser Cut Applique!!! The Gingerbread House had a few more pieces to place so it took me maybe 8 minutes from the time I opened the packages. I found it helpful to use a ruler to make sure my windows and doors were all aligned nice and straight. So with that, 15 minutes later I was ready to stitch, which is my favorite part of applique!!! I decided to add my batting before secure stitching all my applique so that each piece would really pop. I opted for a blanket stitch in black. I think the black really complemented all of these beautiful Christmas Fabrics ;) I find secure stitching applique to be so relaxing. And the gingerbread house was so much fun to stitch. So many fun little pieces!! Then just trim the excess batting and add on all the perfect little finishes. Buttons, ribbons, and stitching, oh my!!! Then a quick binding (using some of my leftover scrappy bindings :) and in a hour and a half from start to finish, I had two adorable Christmas mini's!!!! So ya, pretty safe to say that I am hooked on Laser-Cut Applique!!! It takes out all of the not so fun part of applique and leaves you with the totally fun part!!! I can't wait to do more!! So if you want to give the Laser-Cut Applique a try, or if you want to do the Traditional Applique, here are a few more details on the quilt. And let's get to that Giveaway here!!! 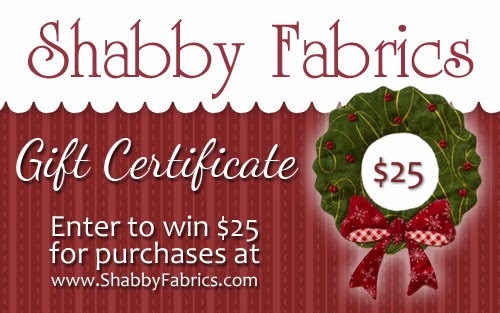 Shabby Fabrics is giving away a $25.00 Gift Certificate to one lucky Happy Quilting Reader!!! Thanks for stopping by and have a very Happy (and Merry) Quilting Day!! my fave block is the gingerbread house. It's hard to choose a favorite block since they are all so pretty! I think the peppermint lollipop draws my eye more than any other block, though, so that's my pick! Hard to choose! I love the tree and lollipop blocks-think the lollipop is my favorite! This is an adorable quilt and looks fun to do. They are all beautiful but my fav is the lollipop! My favorite is the gingerbread house! Brings back memories of my childhood! Oh gosh, I love them all. But since I have to choose just one .... the tree. Gingerbread houses have always been a favorite. Thank you for your informative blog. The sled is my favorite! My favorite is the one with the tree in the sleigh. :) Your blocks turned out gorgeous. The black with the blanket stitching was the way to go! That gingerbread house is beautiful! I've used laser cut applique on three projects and just love it! The gingerbread house is the cutest! Thanks for the inspiration. It's really a toss up for me, I like the stocking, candy cane, and the wreath all equally! I love the entire collection though, especially that white scalloped inner border, what a great touch. I love the lollipop. Must be my sweet tooth talking. I thought it was the candy cane or stocking until I saw your finished house! Love them all really. From the picture of the entire project, it's a toss-up between the stocking and the gingerbread house, but once I see the blocks up close from each of the participants, whichever one they feature is my favorite. These are all really cute. Thanks for the giveaway. My favorite is that lollipop block. I love the entire quilt, but the sleigh and the gingerbread house are my favorite blocks! I love the gingerbread house! Ya know, I never make holiday things because by the time I think about it, it's too late, and if I think of it ahead of time, I put it off until it IS too late. This is a fabulous thing to do in one sitting. I love it! Someone asked this earlier, but I think that I've changed my mind. The gingerbread house is my new favorite now that I can see it up close. I love the roof! All the blocks are so darn cute! I can't decide if I like the gingerbread house or sleigh more. You make laser-cut applique look so easy....I have never tried it. Thank you! HI, all are so neat>I'll select the little Stocking! My favorite is the house. Cozy and tasty! It's so hard to choose but I think I like the gingerbread house the best. Gingerbread houses are one of most favorite parts of the Christmas holiday! You did such a beautiful job on both your blocks! I love them all but the Candy Cane block is my favorite! I love the gingerbread house!! I have all boys and over the years, it just seemed that gingerbread decorations (and cookies) fit our family better than anything else. So, we have gingerbread dishes, gingerbread ornaments, we always make gingerbread houses and gingerbread boy cookies. 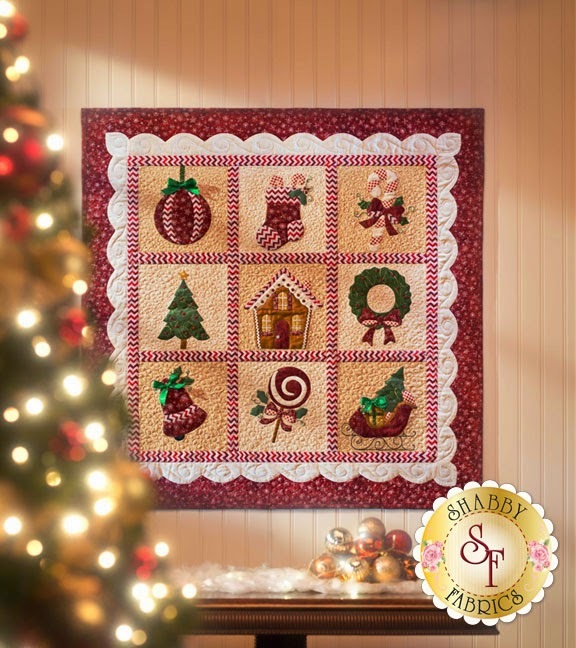 I would love to make this quilt, just for that gingerbread house block! Thay are all so cute, but I have to say my favorite would be the adorable little Stocking. The candy cane is a close second. So cute! My favorite are the lollipop and the gingerbread house!! But all of them are very cute! I think the bell is adorable. I like the idea of using one square as a mug rug to leave out treats for Santa. I like all the blocks, but the sleigh and the lollipop are my favorites. I love this quilt and my favorite blocks are the bell and the sleigh. Thanks! The gingerbread house is my favorite. Just darling! Thanks for the giveaway! The Gingerbread House is my favorite, but each Block just warms my heart! Thank You for this Giveaway chance. Love this and I've been trying to decide if I should sign up or not...thinking I have to, just wasn't sure about the laser applique. Thanks for sharing! My favorite is the stocking. Laser cut applique sounds great! The Gingerbread House is my favorite. Would love to do a wall hanging for my granddaughter, she would love each block. Thank you fro the generous giveaway. My favorite is the sleigh with the Christmas tree. It's a toss up for me between the gingerbread house and the lolipop. How fun! They're all so cute, it's hard to decide. I definitely like the gingerbread house, the candy cane and the stocking the very best! Thanks for the chance at the giveaway! My favorite is the Gingerbread House! I like the Gingerbread block. Love the bell. Thanks for the chance. My favorite is the candy cane. Thanks for the giveaway! All the blocks are adorable. My favorite is the Gingerbread House! I would love to try the laser cut/fusible kit. It looks like a whole lot of fun to make! All the blocks are sooo cute, and your right, doesn't get much easier. Guess my favorite would be the Christmas ornament. I'm waiting to see what the candy cane looks like up close. I love candy canes at Christmas. Thanks. Only one??? That is so hard! The sleigh is adorable, but so is the peppermint lolly...but the gingerbread house is too cute too!!! They are all wonderful! Fusible, my favorite way to applique!!! I love the tree block. It will be fun to embellish with some fun buttons and decorative stitches. Such a pretty kit. My favorite (right now) is the sleigh. My favorite block would have to be the sleigh. Great giveaway. The gingerbread house is adorable. I have been so tempted to sign up for this one. My favourite block would have to be the sleigh. This quilt is just gorgeous. My favourite block is the Gingerbread House. Thank you Melissa for sharing, and for starting up Terrific Tuesday. what a CUTE CUTE set, I like the gingerbread house is my favorite, they are all cute though. So sweet!! I love the sleigh with the tree in it! thanks! I think the gingerbread house - so many possibilities to play with. Thank you for sharing. The whole quilt is adorable...my favorite is the lollipop. I would have to pick the lollipop block. It is just so cute. Thanks for sharing about this BOM. the stocking is just so cute. My favorite block is the Christmas stocking...no, wait--the gingerbread house--and the lollipop...I can't decide! Love the details you show; this looks very do-able for me! I love them all, but especially the ornament block. I would choose the sleigh as my favorite block but they are all so pretty! Thanks for the giveaway and the chance to win! I love the Gingerbread House!!! They are all wonderful, if I'm forced to choose I would go with the ornament block! I love the Gingerbread House the most! I think the gingerbread house is my favorite. Well now... the Christmas tree reminds me of years of picking out a tree in the forest and coming home to discover it looked like a Charlie Brown tree. The Gingerbread house reminds me of decorating gingerbread men and women with our families. The Sleigh reminds me of my Dad hitching up the horse and sleigh and bells and off we'd go for a ride! Love the lollipop. I'm really thinking I need to sign up for this. Machine applique is my favorite thing to do. that is a hard decision. I like the house, lollipop and the bell is cute too. Those are so cute. The block that really grabbed my attention was the lolipop. That gingerbread house is the cutest and my favorite! Love the whole quilt, but my favorite is the gingerbread house. I love the gingerbread house, with the lollypop coming in second. I love the gingerbread house too. So pretty and you always quilt and sew so beautifully. Thank you for always sharing so freely of your talents. Thanks for a chance to win. I've also listed your giveaway on my giveaway list for sewers & quilters @ wowilikethat.com. Thanks again. I like the sleigh the best. Really cute quilt! Christmas lollipop is the best but the sleigh is a close second. Thank you for hosting such a nice give away. Your blocks turned out beautifully. You are inspiring me to machine applique (I have never done that) the kit I got from Shabby Fabrics -- the Little Blessings Pink Ribbon kit. I love the laser cut fusible applique -- that part is done as are the pinwheels, but I haven't done the applique. I really like the sweet candy cane in the Christmas BOM. I can't decide whether I like the sleigh or the big lollipop better. It is a fun Christmas quilt. I love the lollipop block. Can't wait to try the laser cut applique pieces. I'm going for the lollipop--so cute! My favorite block is the red bell with green ribbon...it's precious! I'm anxious to try laser cut applique! I like them all and especially like the scallop edge. My favorite block is the sleigh with the tree. My favorite block is the lollipop! I love this quilt and the two beautiful blocks you made. My favorite is the stocking. That quilt is beautiful. It's hard to pick a favorite, I like them all. There isn't a block in this quilt that I don't like! You made my favorite - the gingerbread house - though the sleigh and the Christmas lollipop come in at second! The entire quilt is adorable, but my favorite block is the candy cane. Love alll the blocks really! :) But the Gingerbread House is definitely my very Favorite! I love the tree block the best. I think that second best is the stocking. They are all so cute though. I like them all but my favorite is the red & white lollipop. I like the stocking best. They are all so cute! What's not to love? It's hard to choose a favorite but I'll say the Candy Cane. The blocks are all lovely but my favourite is the Gingerbread house. Love the Gingerbread house. I love all things called house. I am partial to the sleigh with the presents and tree. I love the sleigh block the most! I like the lollipop and the candy cane the best. I really like the gingerbread house. I like the lollipop block, but your gingerbread house is a close second. Hard to choose just one. I like both the sled and gingerbread house. My favorite block is the sleigh - it's so nostalgic. Thanks for the chance to win, and for sharing your delightful bock and your thoughts on laser-cut applique! The complete quilt is so lovely, but my favorite block is Santas Sleigh. I wish I had time to make this lovely applique wall hanging before christmas this year. I have decided to save the email in my safe keeping folder until I get a break so that I can make it for a friend for next years christmas. Normally I'm not into your hanging but for some strange reason it is speaking to me to make it. Thank you so much for sharing your lovely wall hanging. When I get around to making it I will send you a finished picture of it!. I had already been thinking that the gingerbread house was the cutest of all those darling blocks, and your post absolutely confirmed it. Thanks for walking us through the process. I can't wait to try some laser cut applique--with every stop on this blog tour I am more tempted to sign up! Hard to choose a favorite, I like the lollipop block. This is such a darling BOM! Hard to pick a favorite! Maybe the lollipop! It is a beautiful quilt, and your blocks are lovely. I think the gingerbreadhouse is my favorite. I have to pick the lollipop; that swirl is irresistible! My favorite block is the lollipop block. My favorite is either the lollipop or the sleigh. Can't make up my mind...LOL. Looks like a fun quilt! I really like the sleigh! Thanks for the chance to win! I like the lollipop the best. It has to be the gingerbread house! I really like the gingerbread house! I love all the cute little details on these blocks. I "sew" agree with you laser cut are super and your gingerbread house is my favorite by far! Oh that Gingerbread block is so sweet!!! I love the Stocking block! and the Bell is a close second! Call me traditional.... I think the candy cane block is adorable!!! I love the swirly lollipop! Thanks for the chance! They are all so cute! And all work so well together! If I had to pick one though, I'd be the lollipop! My favorite is the Christmas Sleigh! Thanks for the chance to win! I think the ornament is my favorite! My favourite (Canadian spelling) is the Christmas tree. I like the gingerbread house. Its too cute. I haven't tried appliqué yet but this looks like something I can do. :). Thanks for the chance to win! They are all so cute and i'm having a hard time choosing. My favorite is the sleigh, then the gingerbread house. Thanks for the chance on your wonderful giveaway. The candy cane is really cute and has a spiritual meaning. Thank you or participating in the tour for all of us to get acquainted with new quilters/sewers. I think they are all cute! I love the stocking and the sleigh blocks the best. Love the lolly and candy cane! I love the whole quilt…but really like the each one on their own. I think my favorite block is the lollipop. My favorite block is definitely the gingerbread house, it is too cute. All the blocks are darling, though! I love them all but I would have to say the gingerbread house is my favorite. Thank you...I love the gingerbread house! I like your blocks but my favorite is the sleigh block. My favorite is the ball ornament. Great job on getting it done so fast and machine quilting it! I think my favorite would have to be the sleigh. Thanks so much for the chance to win! I like the gingerbread house the best, then the Christmas tree. I love them all. I love the tree and the candy cane! My appliqué experience is growing, and I can definitely see the ease of pre-fused appliqué for the quilter! They are all lovely, but I think the sleigh is my favorite. I really like the sleigh and the gingerbread house is adorable! I like the sleigh the best! Lovely easy quilt to make. I like the sleigh block best. I love the candy cane block.